Exchange of structured electronic documents such as Invoices or purchase orders with suppliers has been a lucrative proposition for large corporations. The traditional practice of electronic document exchange revolved around Electronic Document Interchange over a Value Added Network. This however, was a luxury that relatively smaller organizations could not afford. Fortunately though, with the internet explosion in India, these small and medium sized organizations are no longer deprived from the benefits of electronic document exchange. Thanks to vastly improved and affordable Internet access, the economic and social benefits of the Internet can now be made available to all by designing daily use services around the Internet. Starting from the time when email messaging was no less than a novelty in India, Mr. Rishikesh Somshetti has seen email evolve from X.400 based email services to open source hosted email services based on Sendmail, qmail etc to the current Google Apps and Office 365, he has seen it all. He has been designing email automation solutions since then. 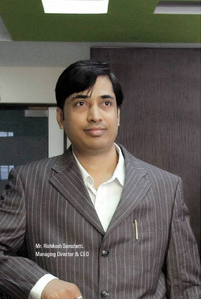 To extend his expertise to larger masses he founded NetGains Technologies Private Limited in the year 2010. This Mumbai based organization has now built their identity as a technology leader in providing enterprise grade mission-critical email messaging automation solutions for Banking and financial companies. NetGains’ impressive clientele comprises of several Indian financial sector heavyweights such as Sharekhan Ltd., Edelweiss, Reliance General Insurance Ltd, HDFC Life Ltd, Angel Broking Ltd and many others.